The 1771 Yaeyama tsunami caused about 12,000 fatalities in Ishigaki and Miyako Islands, southwestern Ryukyu (Nansei-Shoto) Arc. Because the location and mechanism of the source of the 30 m high tsunami have been controversial, it has been difficult to evaluate the possibility of giant tsunamis along the entire arc. The research team consisting of AIST1, HOD2, BRI3 and TGU4 has found a large-scale landslide (more than 80 km long and 30 km wide) in the accretionary prism along the Ryukyu Trench based on the detailed bathymetric data and seismic profiles and confirmed that the slide can generate large tsunami as large as the 1771 tsunami by tsunami simulation. The analysis of tectonic processes around the large-scale slide has found that an E-W trending strike-slip fault has truncated the slope obliquely and removed lower part of the slope to the west. As the result, the slope landward of the fault has been over-steepened. We have concluded that this process has made the slope unstable and caused large-scale slide. Because this tectonic process is unique in the southwestern part of the Ryukyu Arc, we infer that the giant tsunamis comparable to the 1771 tsunami have been repeating only in this area of the Ryukyu Arc. Fig. 2. 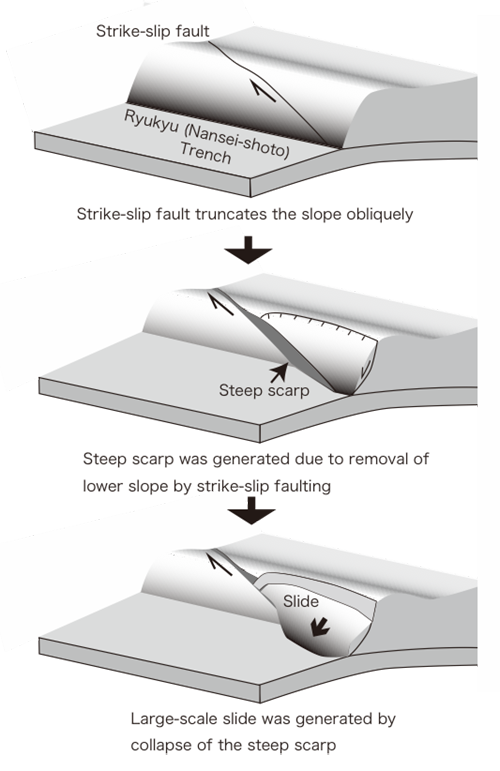 Schematic cartoon that explain the mechanism of large-scale slide generation by strike-slip faulting. 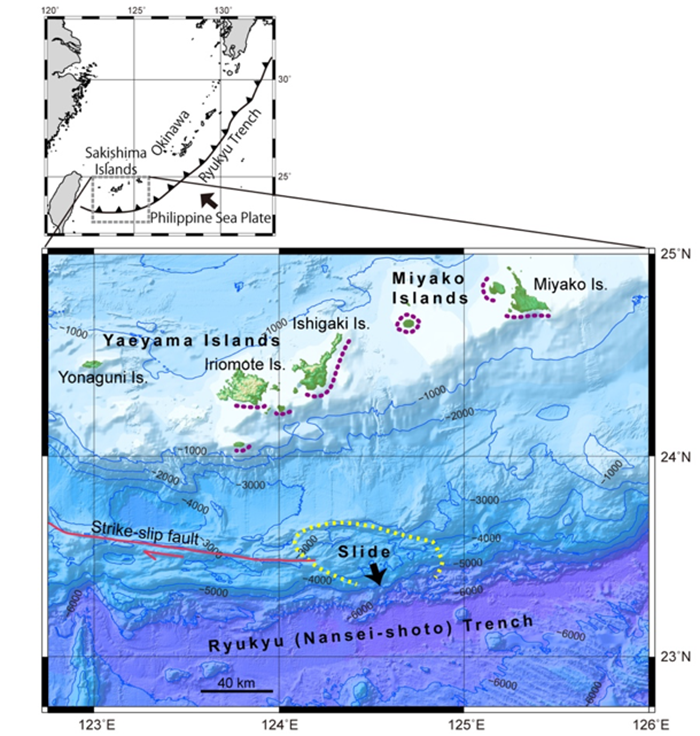 Y. Okamura, A. Nishizawa, Y. Fujii and H. Yanagisawa (2018) Accretionary prism collapse: a new hypothesis on the source of the 1771 giant tsunami in the Ryukyu Arc, SW Japan. Scientific Reports, 8, 13620.